What do you think of my new necklace? Its Eco Jewelry! Those of you keeping track of tortoise news (come on I’m not the only one!) have likely heard about the BrightSource solar energy plant being built in California’s Mojave Desert. While the creation of such a plant seems vital to reducing oil dependence some have questioned if the venture is worth the potential demise of species of threatened tortoises and other plant and animal life. Much debate surrounded the impact the solar plant would have on tortoises in the area, specifically the threatened desert tortoise. In order to move forward with construction, BrightSource had to agree to invest 40 million dollars in plant and animal conservation including transmitters for all tortoises, relocation of the tortoises, and the creation of a multi-acre nature preserve. Relocation cannot be done during the winter so the tortoises are currently being moved to pens to be released into their new location in the spring. Though this seems like a reasonable effort on the part of BrightSource, biologists conducting threat assessments and working on relocation efforts have stated that its not enough and that these tortoises will surely die away. Increased traffic in the area has also led to an increase in injures from encounters between the tortoises and motor vehicles. While I hope the biologist’s are just a cynical bunch, its still hard to stomach when looking at a little guy like the one pictured. Its stories like this that remind me that when it comes to environmentalism, at this point its almost always gonna be a catch 22. I had a dream last night that Zoya shed her shell and there was a new bright green one under it. It was soft and sorta fuzzy. Then later in my dream my friends boyfriend brought home a baby sulcata. Posted in Turtles and TortoisesTagged CPAP Machine, Dream, random, shell, Sulcata, tortoise, turtle, ZoyaLeave a comment on Tortoise Dreams. Just TRY and tell me you don’t want to snuggle that Komodo Dragon. I think it has a career as a pick pocket. Video is a follow up to the article on animals and playtime. This is footage collected by Dr. Burghard and fellow researchers looking at Reptiles, Fish, Invertebrates and Play behavior. 1- Play is not fully functional in the form or context in which it is expressed. 2- Play is spontaneous, voluntary, and/or pleasurable, and is likely done for its own sake. 3- Play is incomplete, exaggerated, or precocious. 4- Play is repeated but not in exactly the same way every time, as are more serious behaviors. 5- Play is initiated when animals are well fed, healthy, and free from acute or chronic stressors. Burghardt’s research illustrates how play is embedded in species’ biology, including in the brain. Play, as much of animals’ psychology including emotions, motivations, perceptions and intellect, is part of their evolutionary history and not just random, meaningless behavior, he said. It may seem a bit obvious to those of us tort owners that have witnessed the antics of our shelled friends, but research surrounding the existence of play activity in reptiles specifically has been few and far between. The article, published in The Scientist (Vol 24, Issue 10, Pg 44), further examines the research presented by and spawning from Burghardt’s work. It delves into issues of anthropomorphizing, previous and current criticisms of the concept of play in these animals, as well as the contexts in which play can occur. Zoya is hogging the space heater. Thad is quite a cutie! I love this photo. Jealous kitty in the background makes it art! 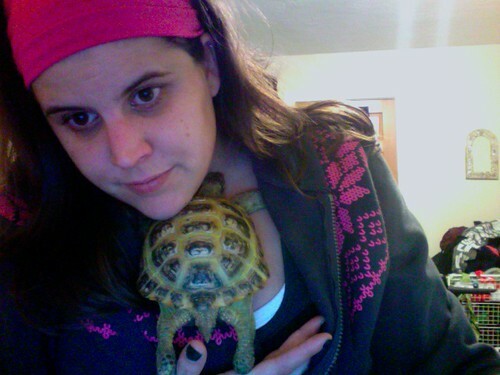 I’m with railtracer, lets not relegate tortoises to ‘other’ pet status. They are just as full of pet ennui as our cats and dogs. p.s. i just noticed that pangur’s creepin on my bed. she jealous. A private plane took off from Albany’s airport today with some unusual passengers; four Gopher Tortoises. A good Samaritan brought one of these tortoises to the flint river aquarium after someone witnessed a semi truck run over it. “We have three more that are going that were transferred from a local rehabber they are sharing the ride,” said Kelly Putnam, a FlintQuarium employee. It didn’t take long before others caught wind of the situation. “A rehabber in Atlanta caught wind of it and she knew a guy who used to be a pilot who knew the pilot that is transporting them,” she said. Today Franklin Perry Cawthorn, a local flight instructor, volunteered his time, and his plane to get these tortoises the urgent help they need. They were flown to the Georgia Sea Turtle Center in Jekyll Island, where doctors specialize in rehabbing turtles. Once these Tortoises are healthy, they’ll be released. Employees will contact the people who brought them in so they can put them right back where they found them. @chairmanMeow Too long for me RT: @zoyapants did you see that social network movie?